Deck Stain for Hardwoods is the best water-based deck sealer for cedar decks, mahogany, redwood and other dense woods. Find the best cedar stain deck sealers and redwood deck stain on the market. 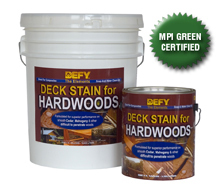 With two coat, one gallon of DEFY Deck Stain for Hardwoods will cover apoproximately 100-150 sq ft, depending on wood texture and porosity. To touch, 2 to 4 hours depending on temperature and humidity. Allow 24 hours for deck before using. From James Westlake of Fair Haven, Michigan on 7/10/2016 . Wow, Good wear, excellent service. Fast Ship! From Anonymous of Gatineau, Quebec on 7/3/2015 .